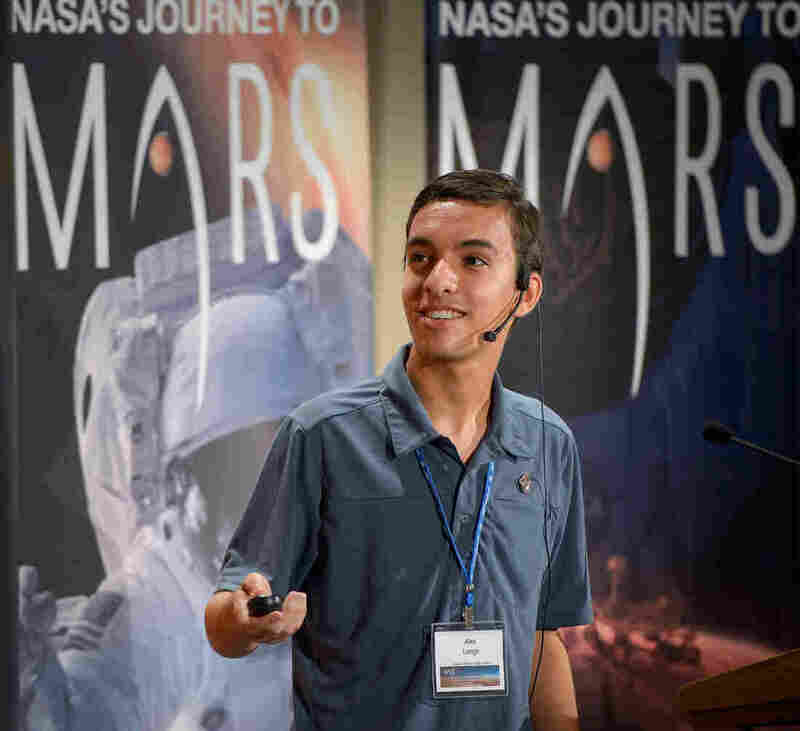 A Teen Might Pick The Landing Site For NASA's Next Mars Rover Alex Longo hopes to be the first person to walk on Mars. In the meantime, the Raleigh, N.C., sophomore has suggested a landing site for the next rover mission. His pick is one of four finalists. Alex Longo says he initially submitted his proposal in hopes of "having a small say" in where the next Mars rover lands, and maybe getting some cool NASA swag. But scientists are seriously considering his ideas. "My first experience with space exploration was in 2005," he says. "I was just 5 years old, and mom and dad had me watch a space shuttle launch." Watching that shuttle launch was the start. Longo decided he not only wanted to go into space himself someday, he wanted to be the first person to walk on Mars. He started following NASA missions on the agency's website, and in 2014 came across an announcement about the next rover mission to Mars. "I saw that they were looking for abstracts from scientists to suggest landing sites," he says. "I decided, well, I'll write something up." He'd written to NASA before. "Each time, they sent me cool space shuttle mission posters or patches," he says. "I'll have my very small say in this," he figured, "and maybe they'll send me some cool stuff." But then he thought, maybe he should tell his mom what he was planning. "He said, 'Hey, Mom, can I send this in to NASA?" Laura Longo remembers. "And I said, 'Well, let's take a look at it.' And I sat down, and it's this multi-page scientific document. And I said 'Oh honey, that's really cool,' thinking he's going to get some more swag — that's going to be great." Her son's proposal was to land in the same place NASA's rover Spirit had landed in 2004, a place called Gusev Crater. Spirit found some intriguing potential signs that there might have once been life on Mars; Alex Longo thought Gusev was worth a second look. NASA apparently agreed. Instead of swag, they sent Longo an email inviting him to attend the first landing site planning meeting. "At first, I didn't believe it," he says. "I thought it was a dream or something. So I just got up, walked away, and a while later I came back and that email was still there. And I was like, 'Wow, I actually just got invited to go to a NASA conference!' How cool is that?" 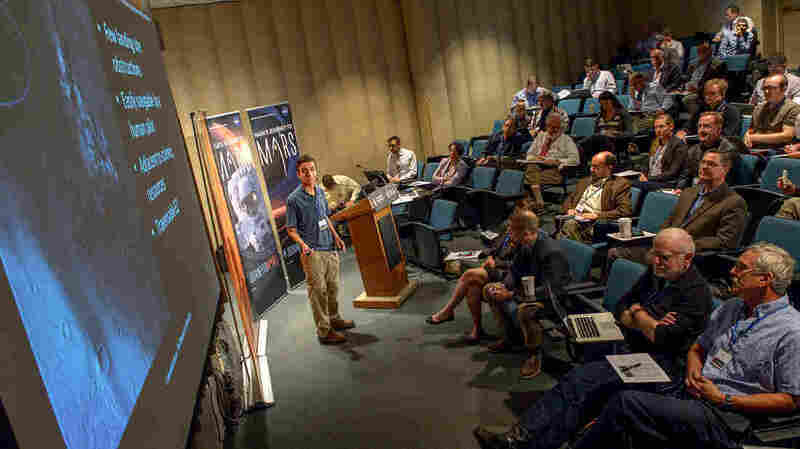 Alex Longo makes a pitch at the Lunar and Planetary Institute in Houston, Texas, in October 2015. The Institute sponsored the conference to pick a landing site for the first human landing on Mars. Long has proposed a site for a different mission — a rover landing. The meeting was in a hotel near NASA headquarters in Washington, D.C. His mom and dad drove him there. Longo was scheduled to speak in the last session of the conference. "Honestly, I was a bit scared," he recalls. "Because there are 125 Ph.D.s and grad students in that room, and I probably am by far the least experienced or knowledgeable person there. And I'm giving a presentation to all these people." "I was focused on breathing, so I wouldn't fall out of the chair," says his mom, who still beams when she recalls that day. "When he finished, the entire room burst into applause. Everybody recognized how special this was for this young person." That was 2014, when Alex Longo was 14. He's now teamed up with some more experienced Mars scientists who also favor going back to Gusev Crater. Their proposal is one of eight semi-finalists. That number will be whittled down to four at a meeting next year. Alex also wangled an invitation to a NASA-sponsored conference that will pick a landing site for the first human landing on Mars. He figured he had to go to that. "Because if I really am going to be the first guy to go there, I want to have a say in where I am landing," he says.